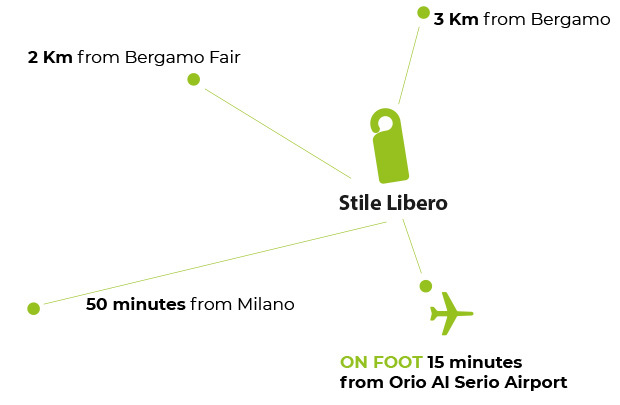 Stile Libero is strategically located in the Historic town of Orio al Serio, just a few minutes from the Airport (20 minutes away on foot), 3 km from downtown Bergamo and only a few kilometers from the lakes, mountains and Milan. The small and quiet town of Orio provides all the necessities (market, bank, post office, pharmacy) with good restaurants, pizzerias and typical trattoria. The nearby airport makes it easy to rent a car or shuttle to nearby cities (Milan, Brescia, Verona). Downtown Bergamo is only 3 km far away by bus or taxi. By car: exit the airport following the signs to Bergamo, get in the right lane. 700 metres later, always get in the right lane and follow the signs to Orio al Serio. 300 meters later, take Via Cristoforo Colombo at the cross with the traffic light and continue for 100 metres until Via IV Novembre. On foot: exit the airport keeping to your right (with the airport on the right and highway on the left). Coasting the airport on the pedestrian path, without ever crossing the street. 1km laterm after the Cemetery, continue to the traffic light. Here take Via Cristoforo Colombo for 100 metres to Via IV Novembre. Take the Bergamo exit and take the overpass to the right heading towards the Orio al Serio airport. After 1 km, follow the signs to Orio al Serio, leaving the road to the airport to the right and the expressway to Lovere to your left. At the roundabout, take the road to downtown Orio al Serio (the second exit from the roundabout) and, after 400 metres, take Via IV Novembre (towards the bell tower).